The Projector Blog: A Projector Rental Makes Any Night Movie Night! Projectors have many uses, just like the one in the photo above! 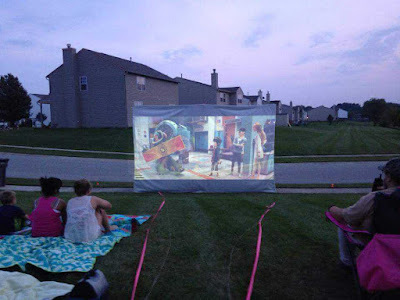 Here we see people enjoying an outdoor movie right in their own yard, utilizing a projector to deliver entertainment for the whole neighborhood! Outdoor movie nights are perfect summer activities that both adults and children can enjoy. It provides a great atmosphere for people to socialize and for families to spend some time together. Unfortunately, projectors are expensive and if you are only looking to use a projector for something like an outdoor movie night then it doesn't really make sense for you to buy one. I mean, why would you buy an expensive piece of equipment that you are only going to use a couple of times (at most) out of the year? This is where a projector rental comes in real handy. A projector rental allows you to enjoy all the benefits of doing something like an outdoor movie night without having to spend a ton of money on a projector. Projector rentals allow you to have the projector for however long you need it, ensuring that you aren't wasting time and money. 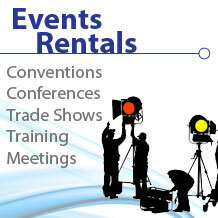 In addition to that, your projector rental from Rentacomputer.com comes with local delivery and installation anywhere in the United States. This means that you don't have to worry about any the logistics or any of the hassles of trying to hook everything up and wire everything because a local, professional technician will handle all of that for you. But what about picture and sound? Sure the projector will project the image but that doesn't do you much good if you don't have anything to project it on. The picture above shows the users projecting their movie on a homemade screen created out of a sheet. While this is a decent DIY screen it won't give you the best picture quality possible. A projector screen rental is a perfect solution. Projector screens are specifically made to work with projectors, meaning you are guaranteed to have the absolute best picture quality that your projector can produce. Sure you can project your movie on a sheet or the side of your house, but nothing compares to an actual projector screen! Finally, you need to deal with sound. A lot of projectors have built-in speakers, but those are only really usable in a small room where sound doesn't have that far to travel. If you're doing an outdoor movie night, then you should also consider renting speakers for your projector. External speakers that you connect to your projector can really amplify your sound quality, ensuring that everyone can clearly hear. If you're planning an outdoor movie night then a projector rental is the perfect solution! Add speakers and a projector screen and you'll have an outdoor activity that the entire block will remember!